We’ve already covered the fight that is being waged against the planned upzoning of a few blocks around the Beacon Hill Link station, but the graphic above that appears in this week’s Stranger just shows how small bore the issue really is. Just one person is holding up the plan for Beacon Hill, reports Seattle’s only newspaper which has Cienna Madrid’s definitive piece on the subject. Overall, there are just six individuals holding up the process for a year at three stations. I like the claim of “loss of breathable space”. People are free to disagree, the problem is that electeds, the one’s responsible, are afraid to make a decision and our legal system profits from meaningless conflict. The issue of upzoning on the South Link **was** fine, but the powers that be went to far – into single family zones and into insulting those that stood up for them. This Beacon Hill proposal might well have been a good idea, but that train may have already crashed, as it left the station. We do have an alternative to this sort of process, we could give corporations priority over individuals. Ooops, excuse me, we already do. Perhaps this is just another small effort to make it **cheaper** to exercise that traitorous conspiracy. What we need is public servants in all branches of government to do their jobs and make a decision respecting every individuals right to express their opinion. Anyone who thinks any individual does not have the right does nothing but to sacrifice their own status as US citizen, if they can be considered human. Tbere is one place for such corporate welfare/bonus sucking harrassing f ups, that’s panhandling in front of the light rail stations. And if they can’t be civil about it, proceed accordingly…..
Bad cup of coffee this morning? Mixed-use mid-rise is residential last time I checked. Not single-family, I agree, but I’m not sure pure single-family has a place within the urban core. I think if density means mixed use — retail, housing AND commercial work places, then I would approve of this zoning. Anything that distributes the jobs and commerce away from just Seattle downtown makes sense to me. I even like the 30 story tower they’re building in Federal Way. I’m not sure that’s going to get built. It seems like a good idea — especially if they time it with LINK light rail service there. Heck, even if they don’t build “high speed rail” how about just a good old fashioned slow boat (what’s LINK’s top speed?) like the Interurban Trolley down to Centralia? It would be like the ‘A’ train in NYC that goes all the way to Far Rockaway (Beach). NC 65 already requires mixed use. Ha, ha ha ha ha. Not that I don’t agree with the point here, but there are times when The Stranger seems like a parody of an alternative weekly. Oops, I might “only newspaper” which is their tagline. It’s just a joke. It is actually Seattle’s Only Newspaper. Same could be said about Kemper in B’vue! Freeman and Wallace maybe a crank on public transportation but what is official view on higher height limits? I would think that most developers would like the idea of higher height limits as it can be more profitable to build up. I’m kind of concerned the same group of people who gamed the process by filing their last-minute appeals this year could keep repeating the process year after year. No matter what the hearing examiner determines with this set of appeals, what is to stop the NIMBYs from filing another appeal in February 2011 resetting the clock on the neighborhood planning process again? This seems like a rather effective way of stopping any zoning changes in a neighborhood undergoing a neighborhood plan update. If the process has an appeal period, filing is pass/fail. It doesn’t matter if one files at the beginning or the end of the appeal window. The window is still open. An appeal at the end of a window isn’t “gaming” the system. And with the complexity of the laws and legal precedents surrounding zoning issues, a citizen seeking to preserve their legal rights in these processes can be well served by taking the time to have their attorneys prepare any appeals carefully. Those who don’t like these delays should consider how much more walkable many American cities would be today if it hadn’t been so easy to ram through freeway-oriented “redevelopment” projects a generation or two ago. The “last-minute” aspect is the part that gamed the process. The process is being mocked by the fact that the appeals were accepted at all. The list of complaints/concerns has nothing to do with the DNS or the proposed zoning changes. We need to look at how to make the process fair and accessible to everyone, while limiting the ability of “individuals” to obstruct things for the sake of obstruction. Perhaps appeals could be required to have a certain number of supporters? Or go through a preliminary review to determine if they have merit? I don’t know what the answer will be, but I share Chris’ concerns that we’ll see a repeat of this charade when it’s time to update Columbia City & Rainier Beach. hi- im i will be attending seattle university in the fall, and am curious whitch areas are well served by public transit. any sugestions would be helpful. The area right around Seattle U and to the north on Capitol Hill is very well served by transit, as are many parts of the city, such as of course Downtown, Belltown, Lower & Upper Queen Anne, the University District, Rainier Valley, and others. Find an apartment near 15th and Madison if you can. It’s within walking distance of Seattle U and you have four routes near there that go downtown (2, 10, 11, 12). Kenn, FYI, SU “public transit” consists of buses. You can also search on seattle.gov for their census results – if you really want to dig /drill down and compare stats for things like median travel times, commutes delays, etc ; broken out per urban village/neighborhood. But in short, nearly anywhere within 1-2 miles of SU isn’t too bad off in regards to bus access. So choosing an area might become more of a cultural comparison for you if you stay close. The same thing happened on Broadway. It was zoned for 4 stories and people said 6 stories would ruin the neighborhood. Never mind that there were already several 6-story buildings at Bellevue & Pine that weren’t hurting anybody. The city finally allowed 6-story zoning on Broadway. I hope the same happens on Beacon Hill and other neighborhood centers. I think height is ok, but I would prefer clear space around buildings, not just one up against another. For example, I think Seattle would be a much better place if they “cleared the underbrush” of small old buildings around the towers like Wamu and 1201 3rd. Compared to the skyscrapers (which are hurting for tenants) those old crappy buildings don’t supply much space anywhere. Imagine just lots of towers (or 6 story buildings) with checkerboard blocks of parkland. Buildings one up against another is better for livability. If you create empty space, it just ends up dead – a void – wasting space where a shop to bring people could have been. The idea that we “need space” has been haunting urban design for a century. Building structures right against each other, or constructing buildings all the way up to the sidewalk is just plain wrong. Put some space between buildings, allow some setbacks from sidewalks. All of this will make it more pleasant to look at and definitely more enjoyable as a pedestrian. That is what makes the new South Lake Union such a disappointment and Belltown a waste of opportunity. The buildings/apartments/condos are built right up to the sidewalk and makes it almost claustrophobic to walk in the neighborhood. With all the designers we have in this region, why do we keep coming up with the same horrible crappy-looking buildings again and again? Just take a look at Vancouver, BC and see how to make a wonderful, walk-able neighborhood. Buildings right up against the sidewalk is how all of those old streetcar suburbs and other pre-WWII neighborhoods everyone seems to like so much were built. All too often wide setbacks and mandated spaces between buildings either end up being problems that have to be fenced off from the public or you end up with the “tower in park” (or parking lot) design that plagues everything from postwar public housing projects to suburban office parks. While designs influenced by Le Corbusier might look cool as architectural models in reality they end up being rather sterile. Modern urbanists from Jane Jacobs on are rather scathing in the criticisms of Le Corbusier’s designs. Remember that “towers in a park” are meant to be accessed via freeway and automobile not via transit and pedestrians. Not built up to the sidewalk in Belltown? Where? I don’t see any parking in front of buildings or other excessive setbacks. Are you saying that open space in general is bad? Because it’s definitely not. Open space is really important for livability. The problem is when open space is created without reasons to go there. Little plazas downtown with tables and chairs lined by cafes and shops would be great; little concrete squares with a bench or two would not. I think that open spaces in moderation is good but to much lowers density and spreads things to much which in turn makes neighborhoods less walkable and can decrease livability. Funny that people are asking for more open space in downtown. I feel that Seattle is a city with an open feeling downtown. There are wide streets, plenty of places to eat outdoors (building courtyards as well as on sidewalks), and the tall buildings don’t make me feel claustrophobic. Visit a city like NYC, London and Paris and then tell me about open space. I’m not saying it’s not important, but I already feel that Seattle does a great job on that. It’s one of the few cities where I can actually go to a park and not feel like I’m in the city. Re-zoning Beacon Hill is not going to change this. In fact, it will more than likely better the way of life for those living there and make it a desirable area to live. Part of me thinks that people who live here fail to realize that they do live in an ever changing city. What people wanted 20 to 50 years ago isn’t what people want today and it won’t be what people want in 20-50 years down the road. Ben, with all respect are you referring to ‘open space’ as in separate-block urban park design [let me use Olympic Sculpture Garden as a downtown example] , or setback, like a creative sidewalk & plaza design [ here I might use the 2nd Ave Federal Building Entrance as a downtown example]. I’m for both (though ‘hood-wide moderation & design wisdom must prevail). Humanity does indeed desire ‘open space’, namely sunlight and sky views: more specifically and scientifically, we need access to the sky to see the stars and clouds and feel the sun (vitamin D production being the science that I’d offer as proof of humanity’s need for open air/sun access). While I like a well-designed Harlem or Greenwich Village rowhouse block, I’m having trouble thinking of a similar example of satisfying building-to-building design in Seattle. So, The beggar’s-run canyon of Brix and Joule on capitol hill: buildings up against one another… tiny token setbacks and out-of-scale impositions… Would these by your standards represent better livability? Was this a joke or meant as trolling? I’m not aware of a stock of “old crappy buildings” downtown. 65′ as a zoning max is hardly skyscraper territory. If it works in Paris, Washington DC, and Barcelona, why not here? However, I don’t think that checkerboard blocks of parkland in the middle of a city is considered a good design pattern. In the planning meetings I’ve been in, asks for checkerboard blocks of park merge into a discussion about setbacks and how necessary they are. And parking, and how necessary that is. If good development is uneconomic, then we’ll just have to be content with more six packs on Beacon Hill. I’d say remove height limits for the entire city. Let the developers decide which neighborhoods make the most sense for 400′ towers. But that is just me. I don’t think that’d be smart. Developers could try to “generate” demand by building new skyscrapers well away from downtown. Then we’d be on the hook for the transportation/transit infrastructure costs. Nah, you just require them to pay for the transportation/transit infrastructure costs to get the permit. i think they’d encounter so many lawsuits in most places that the development would really only go where wanted, needed, and responsible. take the udistrict: why aren’t towers allowed, considering there are three buildings there with more than 12 stories already? sometimes the building code needs to catch up. Well after some reflection I’d have to say you’d want to have some limits on high-rise construction. If nothing else than to prevent some of the stupidity we can see around here from before there was much in the way of zoning. For one you’d want to keep the height step-downs as buildings approached the water. Impact fees are another good idea. You might also want to limit the free-for-all to areas with either an urban village designation or in a transit overlay area. Chris, there’s a nightmare example of the zoning-free, developer-run planning you’re talking about. It’s called Sammamish. In the late 80’s and early 90’s Issaquah and Redmond gave developers virtually no limits. 10-15 years later, the Sammamish plateau had 30,000+ residents (more than triple the size of downtown Issaquah) and merely 2 single-lane roads leading to it from the freeway, and no buses. Apartment buildings went up next to single family homes and dense ‘street of dreams’ Mcmansions were built next to farms. Huge sprawling schools went in wetlands. Strip malls and anchor stores were built without regard for zoning gradation or transportation wisdom. The aquifer for the town of Issaquah ran dry and Issaquah was looking at paying smaller towns to pipe in water. The creek, home to the Salmon in “Issaquah Salmon Days”, ran nearly dry. Issaquah traffic became the worst snarl in East King County. And Issaquah itself hadn’t changed a bit. NO thanks, I’m happy we’ve got the slow laboring machine of zoning in place. Not because it’s slow, but because it does usually work. Small old buildings among the skyscrapers are really important for neighborhoods, as they provide far lower cost space for offices and retail and allow for greater diversity. I agree that it would be good to have more open space downtown, but there are many vacant parking lots so it would be pointless to knock down old buildings when there is so much other space. I think it would be great for the city to buy a few of those vacant lots and convert them into public plazas, with reasons to go there, though, as I said above. That was a bad idea for Paris and it would be a bad idea for Seattle. That “underbrush” is paid for and thereby provides a lot of inexpensive space that permits small businesses and far more diversity than new buildings saddled with debt. It is funny how I just had to write a paper about that very plan this week, and now I am seeing references to it all over the place. Ah the old “plus-shaped” tower gem. Looks just like the projects in NYC. We tried “towers in the park” in this country, and had to blow them up. Your suggestion ignores thousands of years of how humans have created cities and why. It’s the smaller, older, slightly run down buildings that have the cheaper rents that enable businesses to get a start. You might read Jane Jacob’s books…or just try careful observation. The difference with Broadway is that the proposed 65ft zone will be right across the street (17th Ave) from a single family zone of mostly 1 story bungalows. It will look bad, probably like 34th Ave near Rainier does now . As usual the elephant in the room is the single family zone within walking distance of the station. That area doesn’t look bad because there is a 6-story building across the street from single family home, it looks bad because there are a bunch of vacant lots and no sidewalk on one side of the street. In general, though, it would be nice if it stepped down to 40 ft, if just for the half block closest to single-family homes. I live on 10th Ave E, right across the street from the blocks on Broadway that are zoned for 65 feet. My neighborhood is single-family homes. Single family homes within walking distance of a station? So only ten people are within walking distance of the train? I think those areas will eventually be upzoned. Speaking as someone with more than a little land use and design guideline experience, this is all rather misleading. 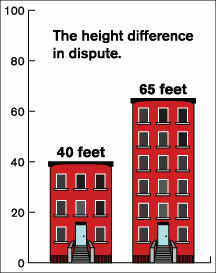 The graphic implies that by adding just 25 more feet, a three story building can become a six story one. A height increase of just over 50% is not going to result in a floor increase of 100%. Generally the rule of thumb I’ve been familiar with is that 3 stories is about 35 feet. A 60 foot building, then, might get you 5 stories, but not six. The typical underlying factor in these height disputes is the cost of an elevator. For basically the same cost of installation, adding a few more floors makes it far less financially problematic. Three story structures are, in point of fact, probably the least attractive kind of structure to build. One story is easy, two can be a pain but depending on how you work them can be cheap. Three generally is going to need an elevator, but doesn’t give much bang for the buck. On the other end, buildings quickly become unbuildable at a profit at higher sizes due to the cost of parking. Thanks to higher parking regulations typical of the U.S. (especially in suburbs,) the developer may be forced to provide at least one (and usually two or more) spots per unit. This generally means some form of structured (read $$$) parking system. More than likely having a 65′ height is going to be needed to make these sorts of developments work along Link, but consider that that is a dramatic shift for these places. This sort of opposition is not going to go away soon. Further, it might be worth it to sit back for a moment and consider if there is some merit to the opposition. These specific areas likely would benefit from redevelopment, but as rail transit expands throughout the region, you are going to see times when this sort of redevelopment will be proposed for healthier, historic neighborhoods with cohesive identities. It’s the clash between the Bungalow Belt and the desire for density and TOD. Here in Portland, we have already encountered this with the expansion plans for the Streetcar. I would suggest to any pro-transit Seattle area resident to watch what happens down here over the next decade and learn from the successes and failures we are no doubt bound for. The benefit of our being on the bleeding edge on this particular issue is that you guys won’t *have* to repeat our experiences to get it right. Unless, of course, your transit agency/planners/governments ignore what every other agency does and tries to make it all up as they go along. Ya know, sorta like every U.S. transit agency seems to do. I believe the number of stories you can fit in a given height limit depends a bit on what the use of the ground floors and upper floors are. In Seattle we generally see 3 and 4 story buildings in 40′ height zones and 5 or 6 story buildings in 65′ height zones. For 40′ height zones you see 3 stories if the upper floors are office space or apartments with high ceilings. You see 4 stories if the upper floors are residential and the builder doesn’t mind having low ceilings, though this can be problematic for leasing any ground-floor retail. For 65′ height zones the “5 over 1” building form is so common as to be cliche in Seattle. For those not familiar with the style this is 5 stories of wood frame over 1 story of steel frame or reinforced concrete. The ground floor is typically retail and the upper floors are residential. A 40′ 4-story building wouldn’t be able to have the typical 15′ retail slot, no. And where are the rooftop utilities? Here we count them as part of the height limits. Also, there will be building code imposed floor heights of some sort. A 40′ 4-story building wouldn’t be able to have the typical 15′ retail slot, no. This is a problem where 4-story buildings have been built in 40′ zones. Sometimes the developer will try to get a zoning variance so they can have 15′ ceilings on the ground floor. And where are the rooftop utilities? Here we count them as part of the height limits. Also, there will be building code imposed floor heights of some sort. I don’t believe rooftop utilities count against the height limit here. I’m also not sure what the code imposed floor heights are but clearly it is enough to allow 4 stories in a 40′ zone. Also Alexander: while parking requirements come up over and over again here in public design meetings, parking isn’t always mandated by the city : if a developer wants to built a parking-less building here (in the urban villages), they are welcome to. They rarely do though, because with parking there’s a financial incentive: they can charge more for the condo if there’s parking included (or so they say). Retail/commerce/industry on the other hand is heavily encouraged to include parking: the idea being that if a Target store goes in, the residential neighbors shouldn’t have their typical street parking options negated by surly target shoppers (and therefore cause congestion of the ‘circling for parking’ variety). As to commercial and retail I’m not sure what the specific City of Seattle requirements in specific areas are, but I do know there is retail space in new construction with no off-street parking provided. With larger stores like a Target or a supermarket the tenant requirements are often what drives the parking more than the local codes. I live three blocks from the station and am in favor of upzoning – I actually chose NC-85 during the planning process. However I think there is some legitimate opposition to the plan update as it exists because it seems solely focused on the zoning. If you read the plan itself there is a lot of vague language about creating a pedestrian friendly environment and many other great goals, but no concrete plan of action to make them happen. It’s lacking defined projects to implement or anything that will actually hold SDOT accountable for achieving the goals. I think the fear is that the upzone will go through and then the city will forget about us again. Meanwhile other neighborhoods will use their Plan updates to lobby for city-funded improvements. In short upzone yes, but update the entire Neighborhood Plan. The Neighborhood Plans may need updates. That isn’t the point of the appeals–they’re ostensibly about the lack of adequate environmental review. If the drawing is accurate, the difference in height is the difference between 3-story buildings and 6-story buildings. In other words the higher limit allows double the density of the lower limit. There are people who consider that insignificant? Twice as many units of housing per lot is an insignificant difference? Or is that drawing not accurate? I don’t think anyone considers this insignificant, or they wouldn’t be involved in the debate. The issue is that we have a light rail station in an area currently zoned as low-density. Four blocks of 65′ height isn’t even a high-density zoning, and is probably along the line of what this neighborhood needs even without a light rail station. And as a minor point, a 6-story building is unlikely in 65′. If I were the zoning czar I might remove limits on building heights right around the station, and taper down quickly from there. As the city densifies I’d expand this circle of unlimited height. This would keep peoples’ precious single family homes while adding a maximum amount of density where it’s needed. No, the drawing is not all that accurate you should be able to get 4 floors out of a 40′ building. If a 40′ building is built with three stories I am guessing that your are going around a 11′ floor to ceiling height assuming all floors are equal height. You won’t get 4 stories out of 40 feet. Not without sacrificing marketability of ground floor retail *and* ditching rooftop utilities. So unless your building codes allow Hobbit sized floor heights, 40′ isn’t going to get you four stories. I don’t believe rooftop utilities are counted against the height limits here and there are some games that can be played with what are considered decorative elements above the height limit. I’ve seen new-construction 4 story buildings in 40′ height zones so I know it can be done. The marketability of any ground floor retail is a concern where this has been done. This is why a lot of developers would like to see the 40′ zones raised to 45′ and why a number of projects in 40′ zones have asked for a height variance. Note that both buildings in the illustration are residential, not mixed-use. Or at least there’s no commercial storefront, no separate entrances for ground-floor units, just one central entry. That’s a style that has been built plenty of places for higher-density residential buildings, and yes, you can fit six floors of it in 65′. But it’s not mixed use, so it’s not really a fair representation of what will be going in around the stations. If these drawings are sort of correct, except they don’t show retail at ground level, then, conceivably, with retail on the ground floor, that would leave 2 floors of residential with 40-foot limits, and 5 floors of residential at 65-foot limits. So the higher limit would actually permit 2.5 times the density of the lower limit, not 2 times the density — 5 floors of residential vs only 2. Sounds reasonable. So at most we’re talking about 2.5x the density for all of 4 blocks. It hardly seems worth the effort to talk about. Toronto is in the midst of a study that will change what is now could be called suburban arterial corridors or streets to neighbourhoods of mid-rises. See this link for more information. The Avenues & Mid-Rise Buildings Study was presented at the Ontario Professional Planners Institute program night. The presentation is available here in PDF form. I am glad, at least, to see that so many other people care about the issue. I hope that all the Beaconians who care strongly about it one way or another will make their opinions heard, and even if you hate the whole “neighborhood meeting process,” please consider showing up at things like the North Beacon Hill Council meetings to get your voice out there.